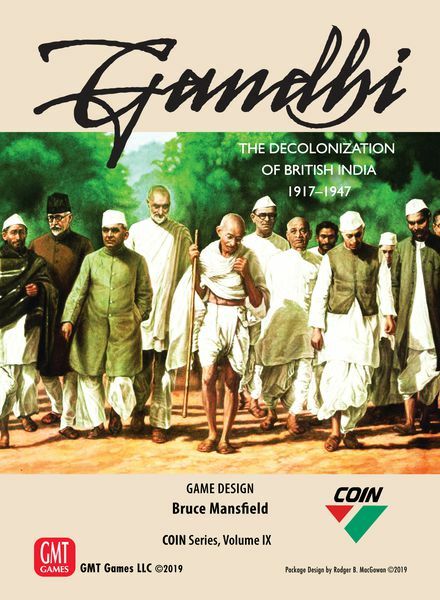 Gandhi: The Decolonization of British India, 1917–1947 is Volume IX in GMT’s acclaimed COIN Series. Exploring one of the world’s most prominent experiments with nonviolent resistance, Gandhi takes us to the subcontinent of India, the jewel in the crown of the British Empire, for a detailed look at the final decades of the British Raj. 1 to 4 players compete to determine the future of India; will the transition to home rule be a peaceful one, will India be split apart by partition or civil war, or will it remain firmly in the grip of empire? Gandhi offers a fresh perspective on the history of insurgency with the addition of a new type of faction to the COIN Series, the Nonviolent (NV) faction, while retaining the multi-faction, asymmetrical, card-assisted system of earlier titles in the COIN Series. COIN veterans will be able to jump right in. Gandhi as the game’s sole leader piece. Nonviolent operations and special activities. Nonviolent activists that are always active, but generally immune from Raj actions until engaged in protests (or caught up in post-terror reprisals). Protests that erode support but leave activists vulnerable to arrest by Raj forces. A Hindu-Muslim Unity track that measures tensions between these two communities, affecting resources, operations, and victory. A British Rule track that reflects shifts in colonial policy in response to events on the map, from resolve to restraint, affecting the cost of several actions. British Viceroys who come and go with each passing campaign and have their own unique effects on each faction. An out-of-play jail space that holds nonviolent forces arrested during martial law. Pieces can be kept in jail over several campaigns, but at a cost to the Raj. Independent Princely States that are never controlled by any faction, yet offer a haven for violent and nonviolent insurgents alike. Short and medium-length scenarios that allow for the study of different periods of the struggle against British rule in India. Support for solitaire, 2-player, 3-player, and 4-player games. In Gandhi, players will face a range of difficult and interesting strategic choices. Following in the innovative footsteps of previous COIN titles, Gandhi weaves together historical, political, and cultural threads and offers an opportunity to study nonviolent and violent resistance in one of the most significant colonial possessions from the age of European imperialism. Civil disobedience and non-cooperation, protests and terror, imperialism and constructive programme, growing unrest, negotiation, agitation, assassination, persuasion, boycotts, martial law, and many other options await.